M.C. Frank: From the G. Heyer Shelf: The Black Moth by Georgette Heyer & Read it Here! From the G. Heyer Shelf: The Black Moth by Georgette Heyer & Read it Here! Disguised as a highwayman, Jack Carstares, the wrongly disgraced Earl of Wyncham, found himself again face-to-face with the wicked Duke of Andover. This time the Black Moth was attempting to abduct dark-haired beauty Diana Beauleigh. Once more Jack's noble impulse to save the day landed him in trouble, but not before sending the villainous duke scurrying. Diana took her gallant rescuer in and nursed his wounds, and soon truer emotions grew between them. But Jack couldn't stay, for a lady and an outlaw would make a scandalous pair. Torn between his tarnished past and the hope for Diana's hand, Jack had one dangerous chance to reclaim his honor— by defeating the Black Moth for good! This is the first book Georgette Heyer wrote, to amuse her convelescent brother. Filled with adventure, romance and humour, I couldn't put it down for a minute. There is a damsel in distress, a hero, a villain and many interesting characters in-between. This is one of those books you can't say enough about. It is also one of the very few books where I really couldn't guess how the author would make things work for the hero and heroine, almost until the end. Their situations seemed to be so impossible. And of course, you know that the heroine will be rescued in time, but the how is so delicious and romantic. And something else. Am I the only one who fell a little bit in love with the Black Moth at the end? I have read it about nine to ten times, and just writing this, my mouth waters. I think I will read it again as soon as I finish this. Georgette Heyer books will do this to you. You can read this book online for free here. P.S. 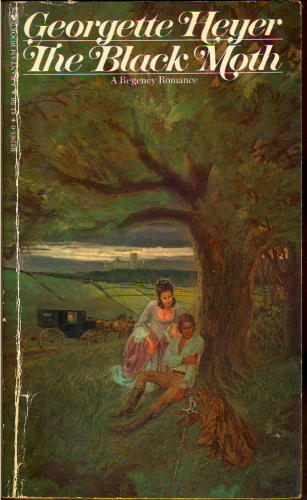 There are many covers to this book and this is from a rather vintage edition, but it depicts one of my favourite scenes in the book and that's why I put it here. It is also the cover of the edition I own. I loved the Black Moth. I put off reading this one thinking that her first book wouldn't be *as good* as some of her others. But I was wrong. This one has a certain charm to it! yes, it certainly does, thanks for your comment Becky :) i also love the G. Heyer blog!! !